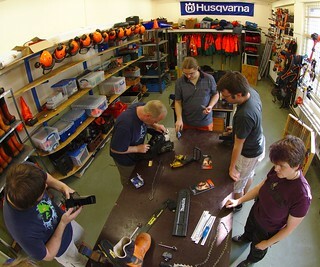 Paul van Bijsterveldt, one of our friendly neighbours and co-founder of vanBijsterveldt&Daamen B.V. Training en Advies offered to give us a quick introduction course to various aspects of motorized chainsaws. We covered aspects such as the safety features of a chainsaw, proper clothing and protection, care, field-stripping and maintenance. We learned how to operate the machine in a safe manner, as well as refueling and oiling procedures, how to ensure proper chain tension and how to sharpen the chisels on the chain. It was very educational and quite a lot of fun too.